How to properly execute the backhand catch when fielding ground balls and line drives. The baseball backhand is a critical defensive skill that all infielders should master. First step quickness is important. Try to beat the ball to a spot. It looks bad if you are lazy to meet the ball at a spot because you were timing it – and inevitably this will lead to more mistakes and missed opportunities. The quicker you move the better angle you can create to help field the ball a step or two closer to home plate. This will give you more time and a shorter throw. When fielding a backhand catch, have your right foot in front of your left foot. Use this unless you have no other choice. 3. Take your glove through the baseball. Once your feet are in a good position, it is now time to use your glove to work through the baseball. You want to try to field the baseball in between your thumb and pointer finger. Take your glove and move it through the baseball. This aggressive move gets your momentum going in the right direction. Once fielding with this backhand catch, your feet are already in the correct position. Push off the back (right) foot and get some momentum toward first base to make a throw. When there is not enough to time. The opposite foot position is used (left foot in front) only on balls where we can’t set our feet in time. After we field this ball (this is a long throw) we need to get some type of momentum and square our feet up to first base before we throw. Work on both types of baseball backhands during practice, because you will need both of them in the games. My son Robby is playing 9u kid pitch 3rd base .At times when throwing to 1st base the throw falls short and not accurate any suggestions. Its difficult to say without seeing him throw. But usually the problem can be fixed when the infielder uses his legs a little better on his throws. 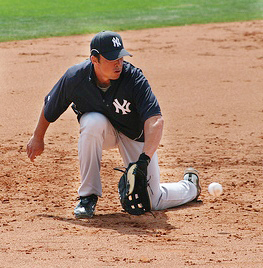 In most routine ground balls, infielders should have enough time to take two hard, aggressive shuffle steps towards first base. This does two things. First, it makes the throw shorter and second, it gets you in a strong and balanced position to throw from. This position helps get the most velocity on a players throws. Just have him focus on using his legs a little more. Good luck and thanks for the question. What do you do when the ball is hit right at you and lands a few feet in front of you. It is an in-between play and I do not know if I should go hard at the ball and try to get it on the short hop or maove back and get the ball on a longer hop. I practice this play and I can never get it right. Sorry it has taken so long for me to get back to you. We just got done with our season so now I have more time to reply. Your coach is correct about getting in front of everything you can on ground balls. There are some ground balls where you may be able to get your body in front of, but if you have to run a long way your momentum may be going in the opposite way of where you need to throw the baseball. In this instance or if you can’t get in front of it, it is time to use your back hand. When fielding a back hand keeping your left foot back will allow you to see the ball better into your glove. Regarding the throw, your right foot is already in a power position. After you field the ball, get your weight on your right foot and bring your left foot so your shoulders and feet are in line with first base. If I have time I will take a shuffle step towards first base and throw. Keep checking the website because we are planning on putting videos with our articles. I know I personally like watching videos more than reading through a bunch of text. Thanks for your question and if you have any others let me know.